Matt has been writing webcomics for many years. Here are a few samples. 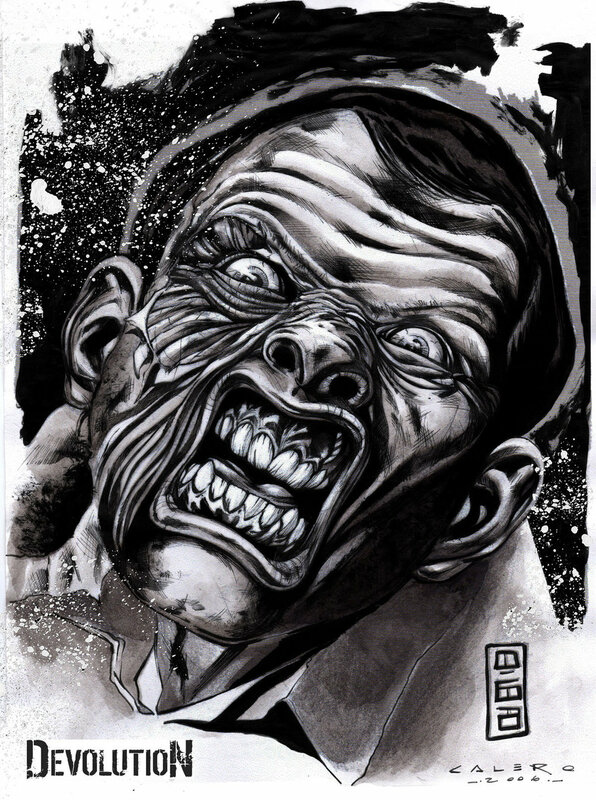 Matt has plans for other independent comics including a vampire horror story called The Communion that explores real-world vampire cults as well as a comic adaptation of Matt’s first science fiction novel, The Calling. To be released in the near future by Arcana Comics, ClosetWorld is a light-hearted fairy tale that turns the light on the monsters in our closet. A U.S. special operations team operates using discovered alien technology. If only they knew the true origin of their weapons and what the implications are for Earth. The Rift is a science fiction series based on my first published science fiction short story. It follows the story of citizens on a lunar colony dealing with the consequences of first contact and how their lives are forever changed. Read the full short story here (PDF). This gallery is one example of how The Rift is created. It starts with a script from Matt which goes to the artist. That artist, Alex Amezcua, prepares a layout for Matt to review. 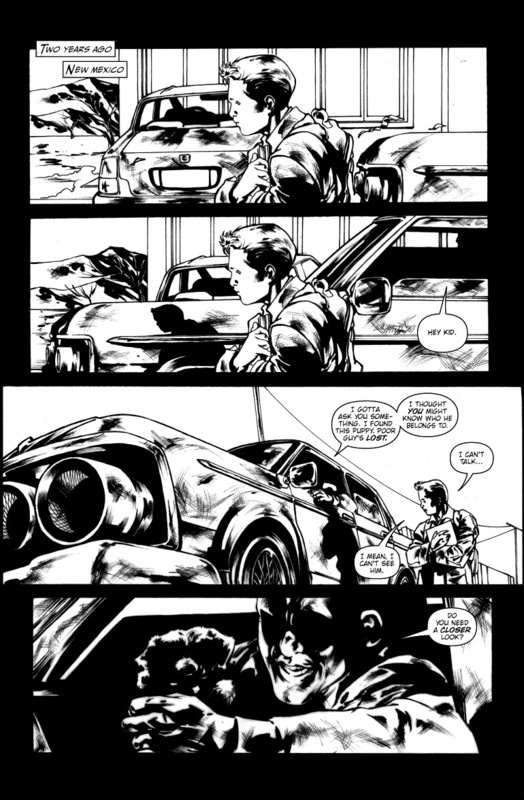 After reviewing, Matt passes it back to the artist to finalize the page, and once the art is done, Matt passes it to the letterer, Chris Studabaker, who brings the final touches to the page. Here is the script that Matt sent to the artist. The images in the below gallery show the progression of the artwork. 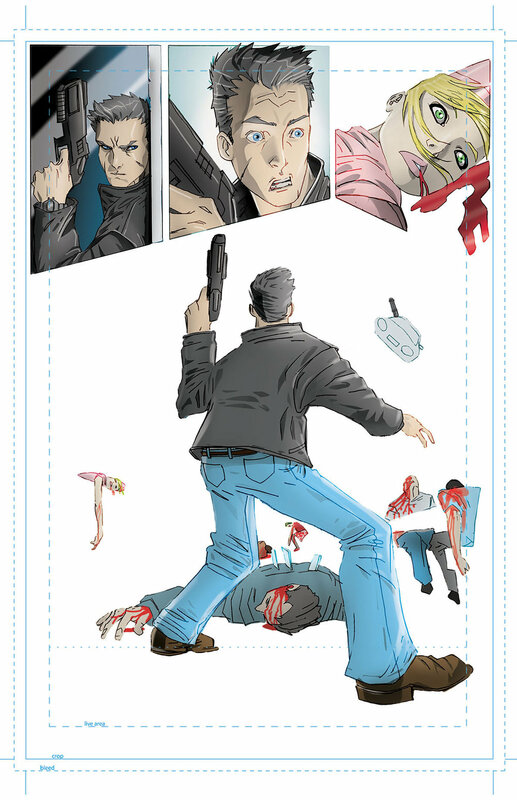 Large splash panel with three small panels near the top of the page inset into the larger splash panel. 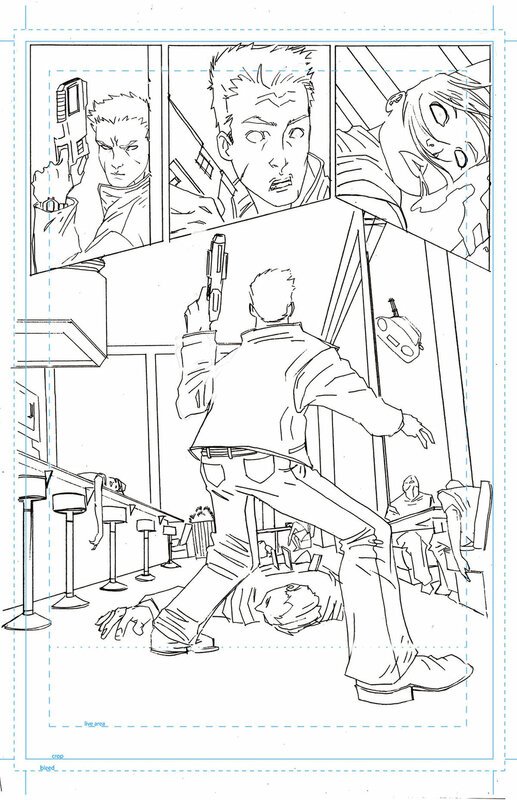 The first small panel shows Jeremiah coming out of the bathroom, crouching low, his gun at the ready (do not show the inside of the diner). Note: Pistols in this series are flechette pistols, firing what would look like razor blades (larger flechette pistols would shoot what would look like metal playing cards). Some can explode on impact, some can spin after they’ve hit their target, boring a hole through something. Sometimes you can see flechettes sticking out of people, but usually it would be like a thin bullet hole after someone’s been shot. The second small panel inset into the splash panel focuses tight on his face, showing shock and horror. 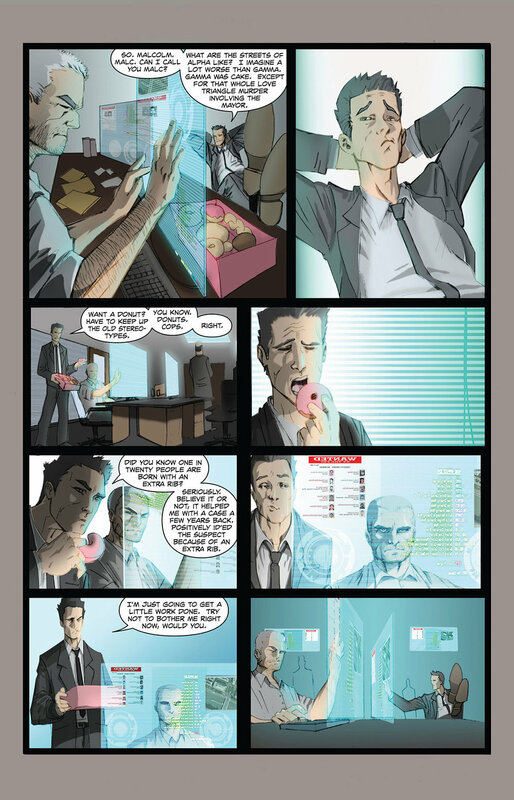 The third small panel shows a close up of the waitress’s face. She’s been shot and has fallen over the front of the bar. Her lifeless eyes are rolled back, her hair is spilled forward, blood streams from her mouth (no gore from her head). The bigger splash panel shows the entire diner with Jeremiah still crouched low. You see the whole body of the waitress now slung over the bar, her head/face exactly as shown in the smaller panel, her arms thrown aside. Everyone else in the diner is dead, some slumped over their plates, some lying on the floor, the gentlemen who was sitting up stiff still sitting the same way, his head slumped over, eyes rolled back, with holes through his chest. Through the window we see an air car has peeled away from the diner, a futuristic machine gun still partially sticking out of the window. 1. 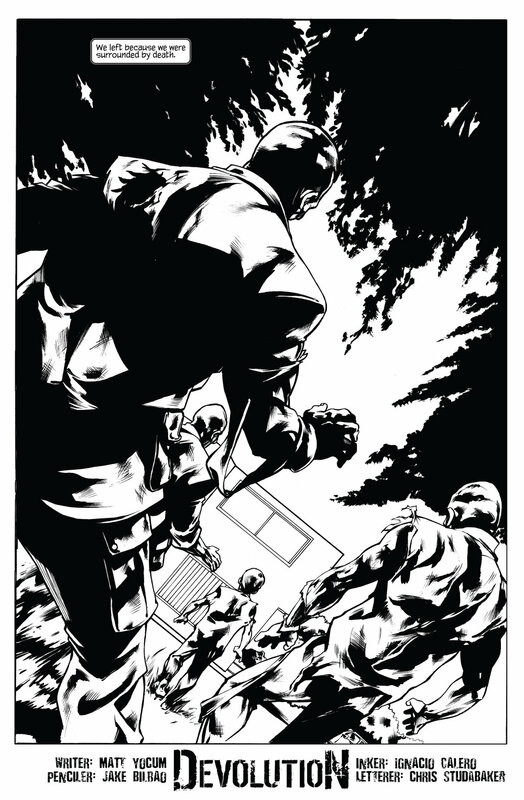 JEREMIAH (IN LARGE SPLASH PANEL, SMALL LETTERING, QUIETLY): I can’t believe they found me. Devolution is set in a small Tennessee town as one married couple confronts unimaginable horror in their home while dealing with shocking events from their past. In the tradition of Image Comics The Walking Dead and television’s Lost, this 4-issue limited series will keep you guessing to the very end.